It is only when we understand our relationship to the animals, birds, fish, insects and other creatures, that we can truly know ourselves and experience the beauty of our interconnectedness. Designed by Nyle Johnston (Miigizi Creations) in partnership with TakingITGlobal & Connected North. On Wednesday, May 9th we launched our Community Gallery exhibition at the Art Gallery of Ontario! Read the CBC's coverage, explore our event photos, and visit in-person through September 30th! It is easy to forget that we are all children of Our First Mother of Creation. Examples can be found throughout nature that connects us to our First Family and Plant Nation relatives. From the flowing river systems that are our veins, to the cedar tree that is our brain stem, the patterns of connectivity are not only beautiful but also inspiring. When I draw or paint I humble myself and try to capture a fragment of the messages, stories, instructions, teachings and beauty that Creation has to provide. My spirit name Wiishkoonseh Miigizi'enh which means Whistling White Headed Eagle. I come from a Storytelling background and I have apprenticed with Storytellers since I was young. I have a responsibility to continue this legacy for the healing of my own people while connecting to the broader world. Sources of my artistic inspiration include woodland painters, Story Tellers and the traditions of my culture. In a time of reconciliation, it is important for all people to know that we exist and have such a strong, beautiful legacy of stories and teachings. Our stories resonate with people across different cultures and they carry universal messages of love, kindness, fairness and care for Mother Earth. We each have a responsibility to share our gifts and I have the gift of being a Story Teller. My logo is my signature and represents who I am. Talking about Spirit names is talking about tradition and culture. When I am asked about my art, the stories come out and people become captivated and interested in learning more. It creates more curiosity from people in learning about the history of our people. It is planting seeds in the minds of people so they can become more aware. Art has a way of provoking our senses and inviting us to explore different ways of understanding ourselves and the world around us. Images can capture our imagination and draw us into a moment, an emotion, a teaching and into a deeper state of curiosity. 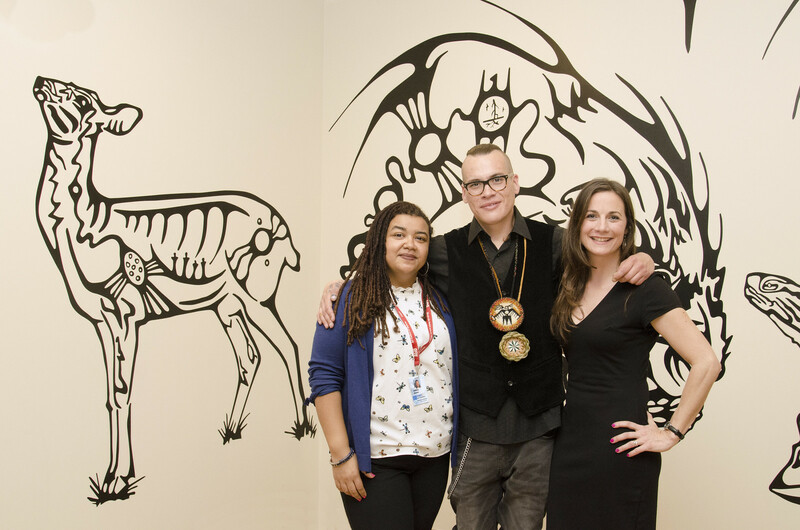 TakingITGlobal's Connected North program has partnered with Indigenous Artist and Visual Story Teller Nyle Johnston at Miigizi Creations to develop an Ojibwe Language and Education Resource Kit called Connecting with our First Family. The purpose of the project is to support students and educators in the process of understanding and appreciating the many diverse Indigenous languages, cultures and communities while strengthening connection to identity and our relationship to the land. The collection of images featuring different line drawings of animals, birds and insects created by Miigizi are being transformed into a series of educational resources, games and learning activities for classrooms and youth groups. The project also serves as a catalyst for developing resources in other Indigenous languages in communities where Connected North partner schools are based. We also hope this will inspire young people to develop their own ideas, creativity and talents as leaders of their communities who have a role in shaping the future. We would like to acknowledge that there are many different dialects and written forms across the diverse Indigenous languages that have been translated as part of this resource and we are grateful to the community members who have shared their teachings, understanding and translations as part of this project. Enjoy these free colouring sheets featuring animals from the Connecting With Our First Family series! © 2018 TakingITGlobal and Miigizi Creations. All Rights Reserved.